‘Dave Thomas moved from Burnley to Queen’s Park Rangers for £165,000 in a lightning transfer deal yesterday, and afterwards both club managers expressed their satisfaction at the way the move had been handled. The action began when Jago contacted Burnley on Wednesday afternoon: “I thought Thomas would be way out of my price range, but the answer was ‘yes’ and the player travelled to London later in the evening,” said Jago, who met Thomas and completed the signing around midnight. Adamson criticised managers who publicly praise young players with other clubs causing them to feel unsettled. 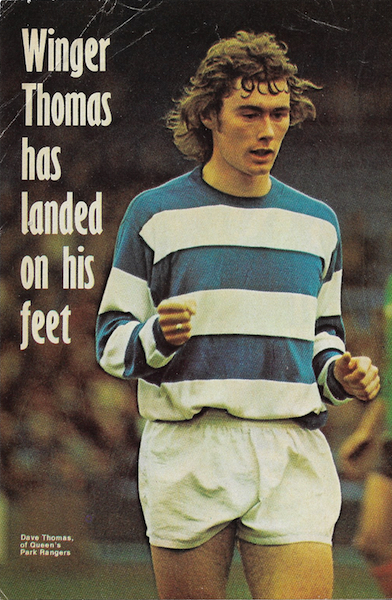 Thomas has left a side leading the Second Division for a club in second place and he was clearly impressed with the set-up at Loftus Road and Rangers’ chances of going up into Division One. “I wasn’t happy at Burnley, and I thought I had nothing to lose by moving.” He plans to marry at Christmas. There can be no questioning Rangers’ ambitions. They have just built a new £170,000 stand, installed £30,000 floodlights and palatial dressing rooms, which cost £27,000. Work has started on lounges and offices costing £70,000, and they have now paid out £275,000 for two new men – Stan Bowles from Carlisle and Thomas. Rangers went on to beat Sunderland 3-2, with two goals from Stanley Bowles and one from Don Givens.